Today I got a Tascam US-144MKII from a colleague because he couldn’t use it anymore with Mac OSX. Apparently this USB2.0 audio interface stopped working on El Capitan. Tascam claims they’re working on a driver but they’re only generating bad publicity with that announcement it seems. So he gave it to me, maybe it would work on Linux. First thing I did was plugging it in. The snd_usb_122l module got loaded but that was about it. So much for plug and play. There are reports though that this interface should work so when I got home I started digging a bit deeper. Apparently you have to disable the ehci_hcd USB driver, which is actually the USB2.0 controller driver, and force the US-144MKII to use the uhci_hcd USB1.1 driver instead so that it thinks it’s in USB1.1 mode. This limits the capabilities of the device but my goal for today was to get sound out of this interface, not getting the most out of it. This will unbind the ehci_hcd driver from the device with system ID 0000:00:1a.7 which in this case is an USB2.0 controller.When plugging in the USB interface it now got properly picked up by the system and I was greeted with an active green USB led on the interface as proof. Copyright 2001-2009 Paul Davis, Stephane Letz, Jack O'Quinn, Torben Hohn and others. Don’t expect miracles of this setup. 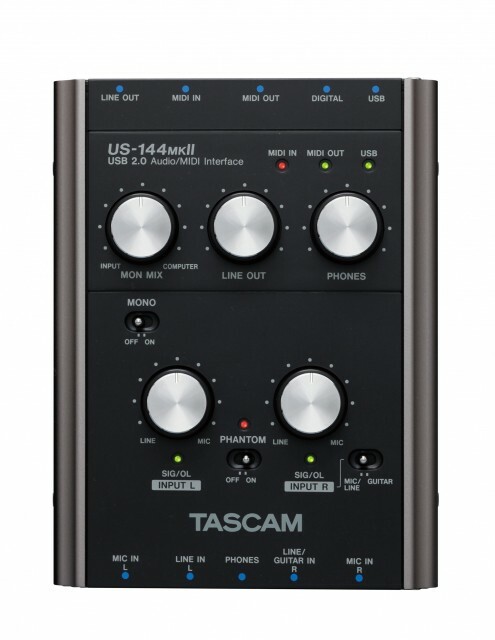 You won’t be able to achieve super low-latencies but at least you can still use your Tascam US-144MKII instead of having to give it away to a colleague. 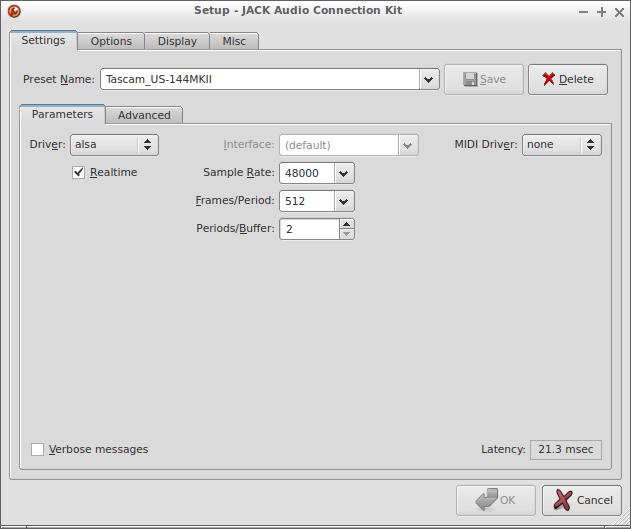 Bus 001 Device 003: ID 8087:07da Intel Corp.
Then I started JACK again with -p64 using an USB audio interface connected to bus 3 (so no rate matching hub in between) and no more xruns, not even with a generic kernel and using WiFi and all. Next hurdle is the onboard sound. Below -p128 I get bursts of massive xruns and so far I didn’t manage to pinpoint the culprit. The lsusb command still shows the devices though. Edit #2: unbinding drivers like described above won’t persist across reboots. If you’d like to make the unbinding persistent you could add the unbind command to /etc/rc.local or create a script that runs at login. 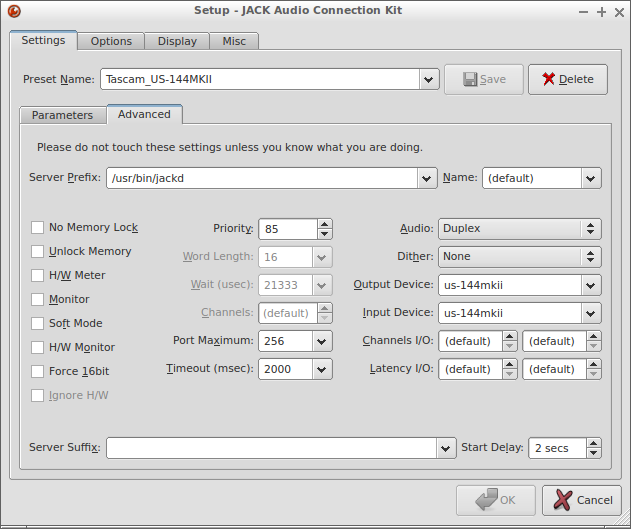 There are other options of course like blacklisting the Bluetooth drivers. Als het echt wat gaat worden met de ALSA firewire-kernel-streaming driver (aka Fireworks driver) dan kun je straks wellicht zonder extra drivers te hoeven installeren je FireWire geluidskaart gebruiken. Aan het FFADO front gebeurt niet zo gek veel, op wat echt grote bugs na, dus het zou me niet verbazen als deze ALSA driver het stokje op de lange termijn over gaat nemen. De oorspronkelijke git branch is recentelijk al gemerged met een ‘private’ ALSA git branch dus wie weet wordt de driver wel onderdeel van de ALSA driver stack.